These small monkeys are diurnal, arboreal, omnivorous, and live in noisy social groups. Their vocalizations include bird-like calls (whistles, twitters, sneezes) that are used to communicate with each other and to warn each other when predators are near. 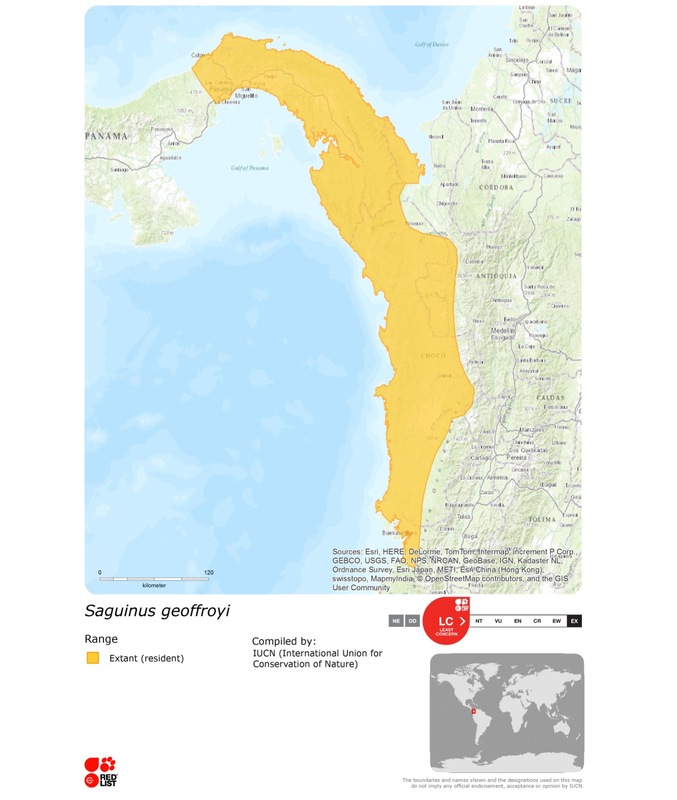 The Geoffroy’s tamarin is found in the forests of central and eastern Panama, and the northwestern coast of Colombia; it’s particularly found in moist seasonal dry forests. They spend most of their time in the sub-canopy and shrub levels of the secondary forest. In Panama they are most predominantly found in the Darien region, but in Panama City you can bump into these monkeys in places like the Metropolitan Park, Cerro Ancon, and Gamboa. 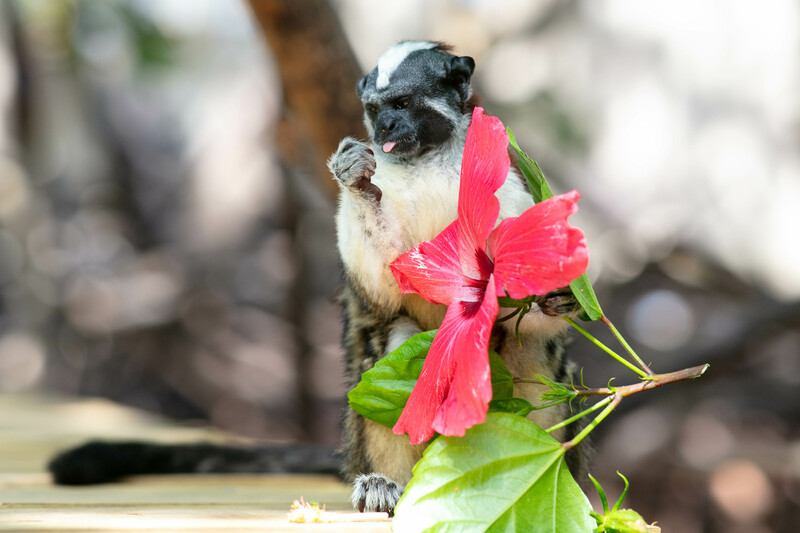 These tamarins have a preference for fruits, and eat a wide variety of them. Their diet also includes flowers, nectar, plant exudates when available (gums, saps, latex) and animal prey (frogs, snails, lizzards, spiders, and insects). They can be found in groups of 2 to up to 15 individuals, but usually it’s 2 to 8 per troop. They’re territorial, and use their scent to mark trees within their range (males do it more often). It’s common for adults of both sexes to migrate between groups. They communicate through visual gestures, and vocalizations (whistles, twitters, trills, loud or soft sharp notes, sneezes and long rasps). Below you can watch a video that explains how their close relatives (Cotton-top tamarins) communicate with each other. 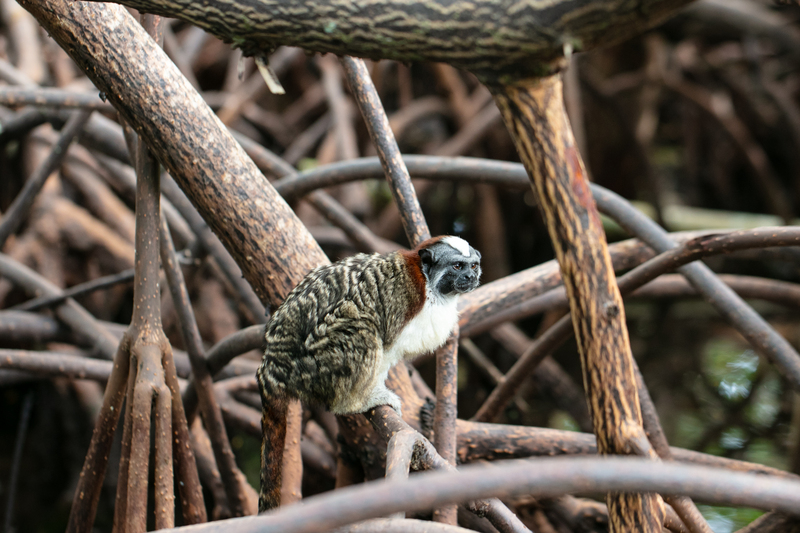 The lifespan of Geoffroy’s tamarin is approximately 13 years, although in captivity they can live up to 16 years. It’s the only tamarin monkey native to Central America. It’s the smallest species of monkey in Panama (even smaller than the night monkey). Unlike other diurnal monkeys, mammals, and birds living in their same habitat, Geoffroy’s tamarins don’t become active neither during or right after dawn. Instead they tend to become active between 45 mins. to 1 hour after full light. Unlike most tropical mammals, they don’t slow down, rest, or take naps during the middle of the day. They remain active during the hottest hours of any day. Their mating season is in January and February, the gestation period lasts approximately 145 days, and the offsprings arrive sometime between late March and June. Geoffroy’s tamarins have a polyandrous mating system (when many males mate with only one female); the fertility of the other females in the group is suppressed by the breeding female. It’s very common for this species to give birth to twins. After birth, fathers are known for taking care of most parental duties.